Dolpo region is one of the most wonderful area in the world and gives you an opportunity to experience an outstanding way of life. This region is another remote hidden destination in the far-west. Dolpo lies in far-west region of Nepal. 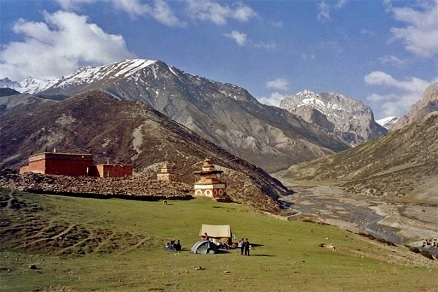 This area is protected by Shey Phoksundo National Park covering part of Dolpo and Mugu districts. It is the largest national park in the country with an area of 3555 sq km. 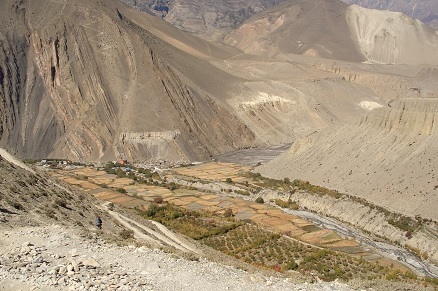 The higher Dolpo plateau in the northeast of the park is drained by the Langu (Namlang ) river. The southern catchment of the park is drained by the Jugdula and Suligad rivers which is flowing south and drain into the Bheri river. It houses the Nepal second largest lake, Phoksundo, also one of the deepest Himalayan lakes. 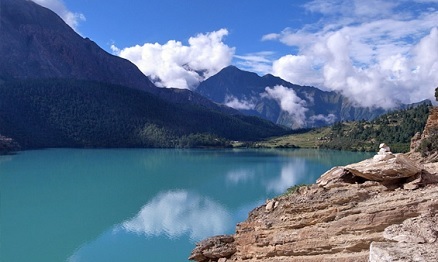 The Phokhsundo lake has beautiful turquoise water and that lies at 3660 m. The region is divided into four valleys: Tsharka, Tarap, Panzang, and Nangkhong. The sceneries are the famous mountain Kanjiroba himal, beautiful glacier and north view of Dhaulagiri range. These cloud barriers cause a semi-arid climate. 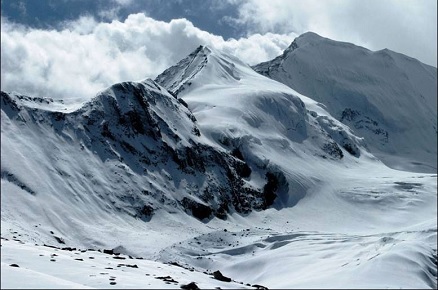 The main objectives of the park are to preserve the unique transhimalayan ecosystem with its typical Tibetan type of flora and fauna and to protect endangered species such as the snow leopard and the musk deer. 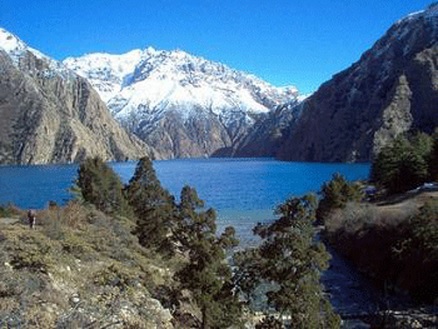 The vegetation found in the Dolpo region is diverse due to the influence of two different micro-climates. The southern river valleys along Suligad contain luxuriant forest mainly comprising blue pine, spruce, cypress, popular deodar, fir and birch. The Jugdula river valley consistes mostly of Quercus species. The transhimalayan area has near desert type vegetation comprising mainly dwarf juniper and caragana shrubs. 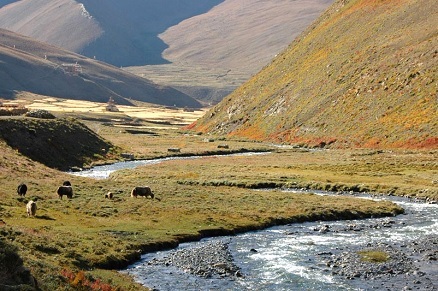 The dolpo region provides the prime habitat for snow leopard and blue sheep. The blue sheep are mainly concentrated around Shey Gomba and Dolpo. Other common animals found are goral, himalayan thar, wolf, jackal, himalayan black bear, himalayan weasel, himalayan mouse, hare, marten and rhesus monkey. It is also rich in birds, the commonly seen birds are Impeyan pheasant, blood pheasant, cheer pheasant, red and yellow billed choughs. The population usually migrates between villages and high-lying (4000 to 5000 m) summer pastures. 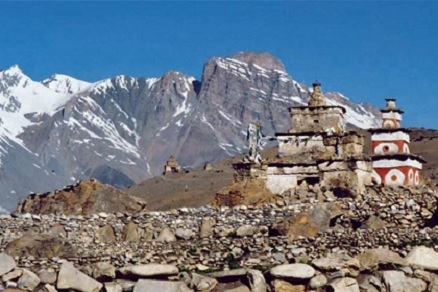 Buddhist monuments and unique human civilization at high altitude is worth of visit. 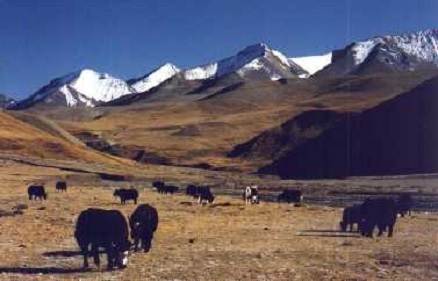 In summer, the caravans of yaks and sheeps run through this valley on a trade route through the Himalayas and allows the exchange, not only for goods but also of ideas between the Tibetan Plateau and the valleys of Nepal. 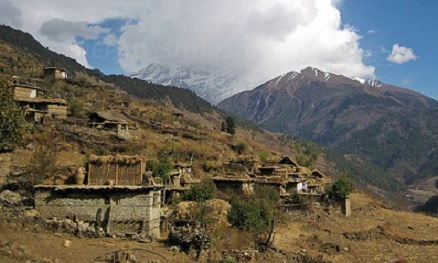 There are 2 main itineraries, lower and upper Dolpo, both in camping style. - Day 1: Kathmandu to Nepalgung by flight (30 mn). - Day 2: Nepalgung to Juphal 2475m via Sulighat by flight (35 mn) and walking 2-3 hrs. - Day 3: Sulighat to Chhepka 2838 m (4-5 hrs). - Day 4: Chhepka to Rechi 2940 m (5-6 hrs). - Day 5: Rechi to Ringmogano Phoksundo lake 3733 m (4 hrs). - Day 6: rest day at Phoksundo lake and side trek around. - Day 7: Phoksundo lake to Yak Kharka 3982 m (5-6 hrs). - Day 8: Yak Kharka to High Camp 4921 m (5-6 hrs). - Day 9: High Camp to Danigar via Bagala Bhanjyang pass at 5241 m (5-6 hrs). - Day 10: Danigar to Numalayan base camp 4440 m (6-7 hrs). - Day 11: Numalayan base camp to Dhotarap 3944 m (4-5 hrs). - Day 12: Dhotarap to Ghyamgar 3756 m (4-5 hrs). - Day 13: Ghyamgar to Laisicap 2772 m (5-6 hrs). - Day 14: Laisicap to Dunai 2140 m (5-6 hrs). - Day 15: Dunai to juphal 2475 m (3-4 hrs). - Day 16: Juphal to Nepalgung by flight (35 mn). - Day 17: Nepalgung to Kathmandu by flight (40 mn). - Day 1 to Day 6: same as lower Dolpo. - Day 7: Phoksundo to forest camp site 3900 m (4-5 hrs). - Day 8: forest camp to Lar Tsa high camp 4120 m (4-5 hrs). - Day 9: Lar Tsa high camp to Shey gompa via Nangdalo Kangla pass 5360 m (5-6 hrs). - Day 10: rest day in Shey gompa and side trek around. - Day 11: Shey gompa to Namgung via Sele Shey pass 5110 m (5-6 hrs). - Day 12: Namgung to Saldang 3770 m (3-4 hrs). - Day 13: rest day in Saldang and side trek around. - Day 14: Saldang to Darsumna Dhobhan 4110 m (5-6 hrs). - Day 15: Darsumna Dhobhan to high camp site 4542 m (4-5 hrs). - Day 16: high camp site to Tokyu via Jyanta Bhanjyang 5221 m (6-7 hrs). - Day 17: Tokyu to Ghyamgar 3756 m (4-5 hrs). - Day 18: Ghyamgar to Nawarpani 3475 m (5-6 hrs). - Day 19: Nawarpani to Tara Kot 2537 m (6-7 hrs). - Day 20: Tarakot to Dunai 2140 m (3-4 hrs). - Day 21: Dunai to Juphal 2475 m (3-4 hrs). - Day 22: Juphal to Nepalgung by flight (35 mn). - Day 23: Nepalgung to Kathmandu by flight (40 mn). 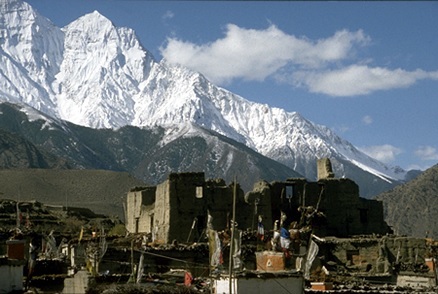 The main difficulties are in the Upper Dolpo. It is the high pass out of Shey gomba Nangdalo (kangla pass at 5360 m), after Shey gomba with Sele Shey Bhanjyang at 5010m and then after Saldang Jyanta Bhnajyang at 5221 m.
As the capital of Dolpo district Dunai is the logistical base for treks to the Tarap valley, Phoksundo lake and inner dolpo. Shey Phoksundo National Park is submited to a fee. Lower and upper Dolpo are submitted to a special permit for restricted area.